January 2013 Decoding Dyslexia of Alabama was established to voice the concerns of parents on the limited access to educational interventions for #dyslexia in Alabama and to work towards legislation. October 2014 Roundtable Solutions committed to our goals. November 2014 ALIDA came on board and most recently Alabama Game Changers along with Alabama Scottish Rite Foundation. We have collaborated with these organizations, parents, and individuals creating the proposed legislation regarding the items presented below. Legislators, education officials, executive branch representatives have been contacted. Below are the talking points, a summary of the proposed legislation and a link of the full text of the proposed legislation. Recognizing + Reaching = Reading. Children with dyslexia are often invisible in Alabama classrooms as they fail to learn to read like other children. 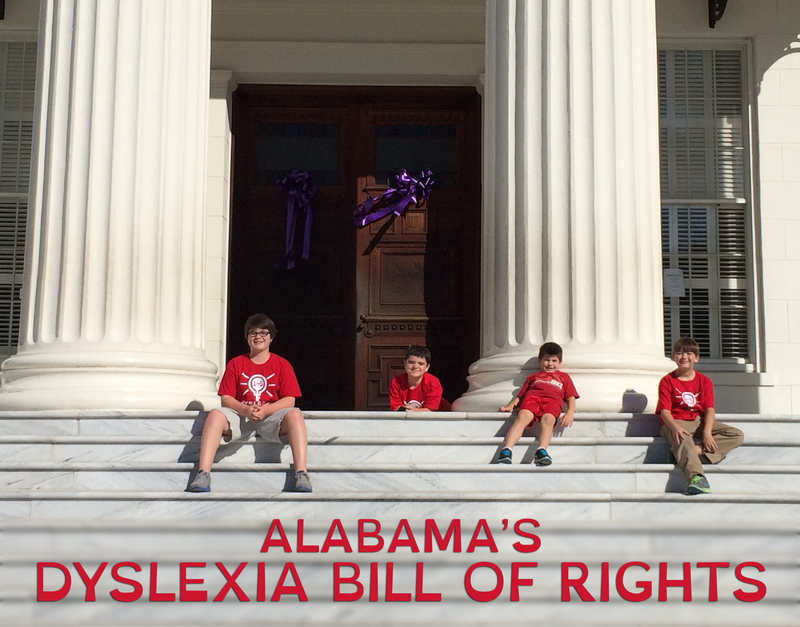 Alabama’s children with dyslexia have a right to be recognized, to be reached, and to be taught to read! Dyslexia impacts between 10% and 20% of children in Alabama schools. May be more likely to be incarcerated. Equip individuals with dyslexia to be literate, productive Alabama citizens realizing their full potential contributing to the economic well-being of Alabama. Provide for early identification and intervention for students with dyslexia in Alabama schools. Do we need to contact our representatives about this legislation? Yes, please share your story and emphasis these talking points with AL’s Dyslexia Bill of Rights. I hope you are well today! Wanted to touch base with you regarding the Alabama Dyslexia Bill. I would love to help in anyway that I could. I have struggled with dyslexia my entire life and have many different thoughts on what needs to be done. Would love to talk if you are interested. I think it is very important that people realize that we are different but not less. I do hope to hear from you. I apologize for the late reply and appreciate your interest in helping with our legislative efforts. I am happy to report huge progress has been made through a collective effort by Alabama International Dyslexia Association, Decoding Dyslexia Alabama, Scottish Rite, Alabama Game Changers and Roundtable Solutions working with the Alabama State Board of Education to develop Administrative Code changes and a Dyslexia Resource Guide without any legislation taking place. On October 8, 2015 the ALBOE voted on and unanimously passed changes to the Alabama Administrative Code that pertain to: Early screening for Dyslexia, Dyslexia specific interventions and accommodations within the general education (K-12) classroom. The reason for Alabama’s Dyslexia Services Plan is to address Dyslexia related learning challenges or difficulties before the child develops a need for special education services. I have updated our What you can do page that includes a link to the new Alabama Dyslexia Resource Guide. Once the AAC changes are finalized we will link to those as well. This is just the first step in a very long process and we welcome any thoughts or feedback. All bills not passed die at the end of a session. Everything would have to be refiled but we are not going to see many bills outside of the budget bills this special session. So just curious if anyone knows when this bill was last filed and if it will be filed next session? On October 8, 2015 the Alabama State Board Of Education voted on and unanimously passed changes to the Alabama Administrative Code that pertain to: Early screening for Dyslexia, Dyslexia specific interventions and accommodations within the general education (K-12) classroom. The reason for Alabama’s Dyslexia Services Plan is to address Dyslexia related learning challenges or difficulties BEFORE the child develops a need for special education services. We did not do this with legislation. This was a collective effort by Alabama International Dyslexia Association, Decoding Dyslexia Alabama, Scottish Rite, Alabama Game Changers and Roundtable Solutions working with the ALBOE to develop these Administrative Code changes and the Dyslexia Resource Guide. I have updated our What you can do page that includes a link to the new Alabama Dyslexia Resource Guide. Once the AAC changes are finalized we will link to those as well. Please do not hesitate to reach out if you have any other questions.